Third day of rain! Everyone's sick of it. Even the farmers. They're watching their crops get ruined. We haven't had many walks. This morning we went early for Her coffee and walked around town. It was sprinkling but the shops have awnings in town, so we could stay dry. After posting Christmas cards, we continued around the block. Even at 7 AM, there's stuff going on. Why can't I go into the bank? You mean I'm not even allowed in the Newsagent's? All in all it wasn't too bad of a walk. When we got home it started to pour again and kept it up all day. It rained all day. Within 3 minutes of us getting outside, Bella snagged herself another baby bird! SHE raced inside for a paper towel to pick up the poor birdie and returned to find Kendra just swallowing the last of it! ﻿﻿﻿SHE expected to find it regurgitated on the clean carpet this morning; but Kendra has a cast iron stomach. The birdie count is now SEVEN! We were up early on Saturday morning. SHE started moving around furniture. We supervised by sitting the doorways and middle of the hall. Then we got in the car and went to get coffee. Adam gave us each a butterscotch button again. Next stop was the river picnic area. We ran around and she drank her coffee. Then home again while she vacuumed everything! We sat outside. Kevin came with his very noisy truck and steam cleaned our carpet. We're lucky, he lives next door and gives us a special price. That isn't snow, guys. It's the dirt from our carpet. Actually, it wasn't too bad this time. We have our carpet cleaned several times a year because Kevin is so handy. While the carpet dried, we went to Millie's. She is still a wild child.......wants to be constantly playing. We finally growled at her and she calmed down. Then it was back home to replace all the furniture. And we had to wait outside until we were brushed. So, my friends, we missed out on our morning nap, mid-morning nap, noon nap, and after lunch snooze. We were very tired! I suppose it's a good thing that it teemed with rain all Sunday, so we could catch up on some much-needed sleep! First of all, Happy Thanksgiving to everyone. Fiesty Three, we loved your Smile Box. Today was just a normal day for us because we don't celebrate Thanksgiving. But we thought we'd join in the Adoption Stories. Anyway, I was put in a box in a car and driven to a new place. I sat in the box in the kitchen, while a huge scottie checked me over. Then I was allowed out. 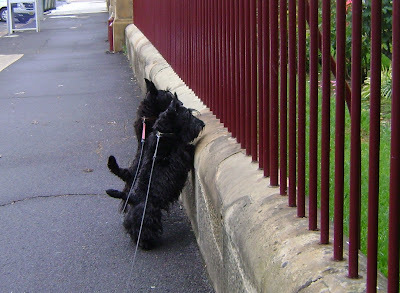 That scottie was Carys. She was a good sort and was very patient with me. Carys was the perfect scottie. Daisy thinks she's going to be the perfect scottie. Carys went everywhere with HER, parties, barbecues, sports events.....just everywhere. Naturally, I was taken as well. They tried everything to socialise me; but I just wanted to be left alone with my new family, in my new house. Eventually, I won. I'm eleven and a half now, and pretty much do what I want. I love my family, but DO NOT LIKE ANYONE ELSE. I was an only dog for awhile when Carys died. Suited me. I don't like change much. But one day, I was collected at the kennel camp and came home to find a wriggly puppy. It was Daisy. She was fun to play with, so I suppose it was okay. Now we've got another one; but she's scared of me. Daisy, here. Who knew that Kendra had so many words in her. Usually, she's more aloof. I suppose the computer is easier to cope with. Anyway, I was adopted when I was 8 weeks old. I was born in Victoria. The state to the south. My brothers and sisters and some Westies were put in a car for a long drive to Sydney--over ten hours. We stayed overnight and the next day was Mother's Day. We were microchipped and a stranger came and looked at all the puppies. Originally, I was going to go to Hong Kong for breeding. But when our human spent time with us and talked to the breeder (who is a Vet). SHE was told to take whichever female SHE wanted. Well, I ran around and kept coming up to her. SHE even admits now that I chose her. Well, there was another looooong car drive--six hours this time. We went to Camp and picked up a grumpy scottie, Kendra, and went to my new house. I explored everything. Actually, Kendra was very good about playing with me. She says she liked being an only dog; but she liked having me around--as long as I didn't don't touch her food. She's getting old now, and I'm taking over as top dog. Then one night SHE came home late--way after our dinner time and brought in a crate. There was something growly and snarly in it. When we stopped, SHE took my crate into the back verandah. Two huge heads came up and started sniffing me. SO YES, I was very cranky. Then they all disappeared. I got out of my crate and followed them inside. AND it was dinner time! I was very hungry. Once we all had full stomachs--I ate in the bathroom so Kendra couldn't get my dinner, we made friends. I would retreat into my crate whenever I was tired or overwhelmed. That lasted about two days. Daisy is fun to play with though I have to badger her sometimes; but I leave the old girl alone. This has never happened before! Look how close we (Daisy--left, Bella-right) are eating our lambshanks. Usually we stake out our own territory somewhere in the garden and stick to it! SHE could not believe it when she saw us! No growling, just mutual enjoyment. Have a beautiful day and great start to the week! First we stopped by the coffee place for HER cappuccino. SHE always gets a butterscotch button with the coffee. Today Adam gave her some for us, as well! Yummmm! Then we went to the picnic area by the river, again. Some grotty people had left their rubbish from KFC all over the place. So we helped clean up the edible bits, and kept the birds away, while SHE picked up the packaging. Then, we heard some noise coming from the other side of the river--where the beach is. Being a scotty, I had to check it out! Bella was very curious, too. It was the Dragon Boat Club having a practice. The good news is that the fleas seem to be gone! A thorough search this afternoon found none. We'll keep checkin'. As I said, having fleas around here is uncommon. We don't have ticks either....at least where we live, as a rule; but we'll keep a look out for them, too. Thanks for all information about available products. But enough about those pesky bugs. The really exciting news is look what SHE found at the shops! Even Kendra's baguette-stealing skills wouldn't work here. There were six little bags.....that means two bags for each of us, right? Wrong! We only got a few to taste. They were out of this world, little balls of cheese and bacon flavour. I'm trying to catch one here. It bounced off my nose. You have to be quick before one of the other's gets it. Bella didn't have a clue. It just bounced off her head. I at least tried to catch it. Kendra is the best at catching food, she rarely misses......but we couldn't get any pictures. Would you believe we had to share ONE little bag AND it wasn't shared out fairly? I keep track of these things. SHE managed to get the lion's share! Now the other five bags are high up in the treat cupboard. Sometimes life's so unfair. For the past two days, we've been scratching and scratching. When SHE checked us. SHE found fleas! This is me, Daisy since you can't tell us apart, scratching. We've been in drought for so long; it's usually hot and dry. So we have NEVER had fleas before. When SHE lived in Sydney a hundred years ago where it's hot and humid, it was a constant battle: an endless cycle of bathing dogs, washing bedding, flea wash, flea spray, cortisone needles, you name it! It's all this rain we've been having, and cats. Today, SHE went out to arm herself with flea shampoo, Frontline and Capstar. Luckily, the first stop was our vet's office, where SHE was presented with these very expensive chewable tablets that are supposed to do EVERYTHING! ﻿Have any of you tried them? SHE'S a bit sceptical. We had our tablets, wrapped in cheese, with dinner a few minutes ago. Here's Bella standing on the beach. We awakened to pouring rain this morning. Even the flowers are looking down-trodden. Kendra ventured out because she had to. Bella has been out looking for birds! 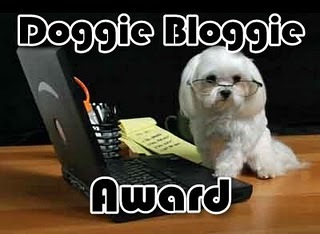 Early last week, our friend Levi Mac gave us this Doggie Bloggie Award. We feel very honoured that he thought of us. If you haven't met Levi Mac before, you should go visit him. He only found his forever family last June and started blogging in August. So he's trying out all sorts of new things and having new experiences. We love visiting him. We did receive this award not long ago, so we won't be following the rules (again), but we just wanted you to know what a great fellow he is (girls, he's a hunk; and guys, you've got some competition here) and how much we appreciate the award. This morning we all piled into the car to go to the river via the shops and coffee place. We didn't walk along the river today. While SHE had her morning cappuccino, we ran around the picnic area. Then walked up the hill. We were free to run around like........well....like dogs. Kendra went AWOL as usual, so she had to be put on the lead. Even Bella was fairly well behaved, just watching the cyclists and walkers today. No chasing. After an hour, it was time to go home. Bella refused to be put in the car. She was so cunning that she came, sat, got her treat and ran away. Finally she jumped into the driver's seat by herself. Obviously she wanted to get in by herself. We thought she was very naughty. We got home and found that Kendra had helped herself to a baguette! Wordless Wednesday--What's he doing now?